I’ve had folks e-mail and post on the forum, asking questions about the specifics of my food storage. I’d like to take a chance to answer those questions before the next installment of the Real Food Storage series comes out on Monday morning and my radio interview on Thursday night with The 21st Century Homekeeper. 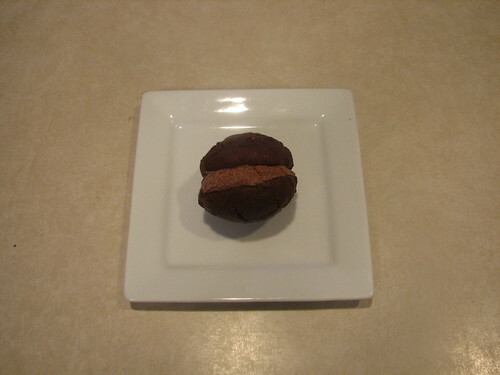 This cute little guy is the whoopie pie that is in the Valentine’s Day Menu Mailer. He’s about 2 inches tall, a portable treat that’s perfect for little hands. They are gluten and dairy free, and they can easily be made egg-free by using an egg replacer for the cookie. The whoopie pies are for the kid in all of us. The frosting is thick but is low in sugar. I am thrilled that I finally figured out a method to make frosting that doesn’t require white powdered sugar or dairy to thicken it, and this recipe only contains a small amount of powdered rapadura for the sweetener. Another method is used to thicken the frosting. The Valentine’s Day meal has a beef recipe, two side dishes and two desserts. The main meal is an Asian-inspired steak, pilaf and vegetable dish. The steak was just as good cold on a salad the next day as it was hot. This recipe is now my personal go-to recipe for all cuts of steak, we enjoyed it so much. The other dessert is called Chocolate Euphoria. It is an ingenious custard that will only take a few minutes to make and doesn’t require the oven or a water bath. It’s a great finish to a meal where you’re hosting company because they’ll think it took you a lot of time, effort and fuss to make it. You can smile and thank them for the compliments instead of telling them it only took about 15 minutes to make! The Mailer also contains four other dinners and one breakfast. You can purchase the mailer here. We are, for the third time this winter, getting snow. The snow is supposed to fall until Tuesday and we’re not supposed to go above freezing. Their total prediction for this area is 4-6 inches last I looked, but we already have 3 inches and it’s supposed to snow through Tuesday! They change the forecast hourly it seems. Last year during the big 15″ snow, we had no power and I was hunkered down with cabin fever, alternating between loom knitting an afghan on a knitting board and planning the first garden revision via lantern and graph paper. I spent hours on that garden, even after the power came back on. I became a one-track mind, weaving the garden and a massive expansion plan involving terracing and moving fences into our homestead master plan. After multiple revisions and hours of discussion, we planted and worked… and worked… and worked. And the garden failed due to alternating drought and flooding. Failed miserably and painfully, after the hours of planning and toil. It was disheartening to the point I decided to scale back for 2011. With the amount of time and dedication a garden takes, I was scared to devote too much to it and experience another failure.